Norton Detectives obtained a search warrant for the hotel room Holland was staying in at an Extended Stay America in Norton. 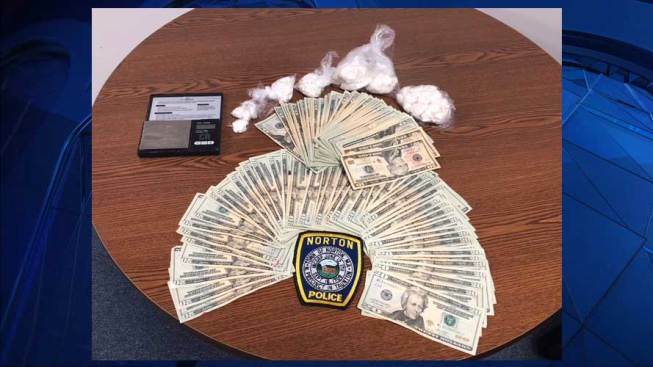 Police recovered 280 grams of crack cocaine, along with $2,500 cash, according to police. Holland will be charged in Attleboro District Court at a later date on these charges, according to police. Massachusetts State Police have arrested a fugitive wanted on firearms and drug charges after a pursuit by car and on foot. Thomas Holland, of Taunton, who turns 32 on Saturday, was arrested Friday in Norton and charged with resisting arrest and attempted carjacking. The car's driver, Brittany Pasternak, of Somerset, was also arrested for assault and battery with a dangerous weapon and malicious destruction of property. Holland was wanted in connection with a September shooting in Manchester, New Hampshire; for waving a firearm at people on Taunton Green June 2 and then kicking in the door of an apartment while trying to evade arrest; and in connection with a large amount of crack cocaine Danvers Police recovered in a motel from which Holland had just fled on Aug. 1. Holland had been arrested in the Taunton incident after police found him hiding in a shower in the apartment he forced his way into. After making bail, however, he failed to show up for his arraignment in Taunton District Court. New information led troopers to establish surveillance Friday at a hotel in Norton, where around 4:45 p.m., authorities saw Holland and Pasternak in a car in the hotel's parking lot. Troopers tried to stop the car before it approached Bay Street at Interstate 495 in Taunton by boxing it in, but Pasternak backed it into a cruiser before fleeing and striking an unmarked Norton police cruiser. Police pursued the car, which then intentionally struck a Norton police detective cruiser. The suspect car then drove at another cruiser before going onto I-495 southbound where it was traveling in all lanes, including the breakdown lane, at high rates of speed. The car exited at Route 138 before entering I-495 again. When traffic got heavy just before the exit to Route 24, Holland jumped out of the car and ran north on I-495, attempting to open doors of and get into vehicles stopped in traffic. All responding officers converged on Holland and arrested him without further incident in the middle lane of I-495. State troopers were assisted by Norton police and Raynham police detectives. It wasn't known if Holland and Pasternak have lawyers.